DANGEROUS tackles will be more heavily punished in 2016 as the AFL clamps down on tackles made with a lifting, slinging or rotating technique. Under revised interpretations of the law sent to clubs on Thursday, umpires will apply a stricter adjudication on what is acceptable, while the Match Review Panel will now enforce a stricter definition of dangerous high tackles that cause forceful high contact. However, the League decided not to make any changes to limit the tactic of players going 'third man up' at ruck contests, but has vowed to monitor the practice. 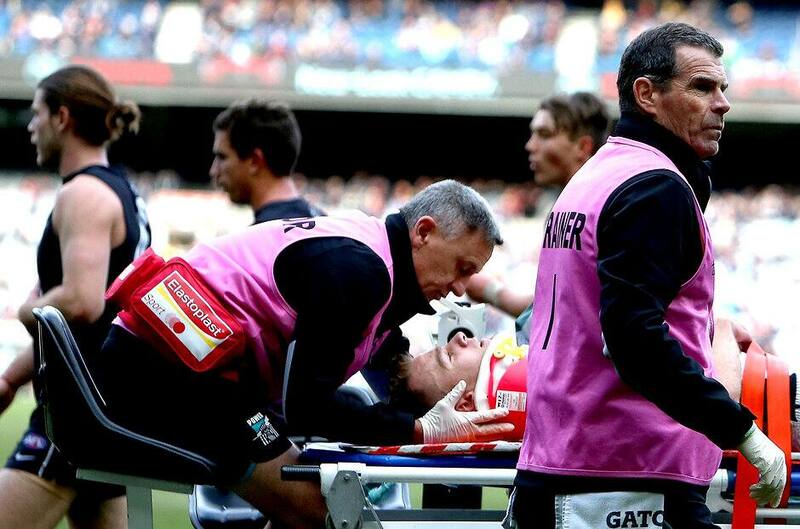 Carlton's Bryce Gibbs was suspended last season after pinning the arms of Port Adelaide's Robbie Gray in a tackle, while Port Adelaide's Jay Schulz was cleared when Sydney Swans opponent Ted Richards was knocked out as a result of a the Port forward's tackle. Both incidents caused significant debate, leading the AFL to work to clarify the definition of an acceptable tackle. The wording around the potential to cause serious injury will also be expanded to include "intentional head-high strikes and high bumps with significant head contact and/or player momentum". The AFL Commission approved a recommendation to increase the size of the protected area around the mark but a trial on the potential new distance will occur in the 2016 NAB Challenge. Umpires will also strictly monitor the handover of who is guarding the mark in 2016, and the interpretation of deliberate out of bounds will be even stricter next season. AFL.com.au understands there was strong discussion around trialling a rule that would see clubs lose possession if their last kick or handball went out of bounds but that will not happen. Rather, the AFL will monitor results of the new rule being adopted in the SANFL. A similar rule was trialled in the 2011 NAB Cup but the League decided against adopting it at the time. The AFL has also made a significant change to the MRP process with the League now able to appeal a 'manifestly inadequate' sanction or classification handed down by the Tribunal. Last season the AFL felt it could not appeal a suspension perceived to be too light, but a player or club retained the right to appeal a penalty thought to be too great. Finally, contact with an injured player will now be deemed as a fixed financial sanction on the table of offences. AFL football operations manager Mark Evans said the AFL Commission had determined that the changes would spread the game out, protect player safety, and improve umpiring. The Commission had taken feedback from fans into account, he said. "The view of the AFL and the Commission is that a series of tighter interpretations in the areas of dangerous tackles, boundary line play and the protected area for the player with the ball will deliver an effective result for how the game is player and how it looks next season, compared to undertaking more serious changes to the game," Evans said.